Take today to enjoy the beauty of the earth, which the Lord has created for Himself! We have the awesome privilege of enjoying it, too! "Make a joyful noise unto the Lord, all the earth: make a loud noise, and rejoice, and sing praise. Sing unto the Lord with the harp; with the harp, and the voice of the psalm. With trumpets and sound of cornet make a joyful noise before the Lord, the King. Let the sea roar, and the fulness thereof; the world, and they that dwell therein. Let the floods clap their hands: let the hills be joyful together." There is information on various ministries I've been involved in, as well as just some fun info for family and friends, and interesting stories on family members (like Jerrie Mock, first woman to fly around the world), and more. This page last updated: September 22, 2005. 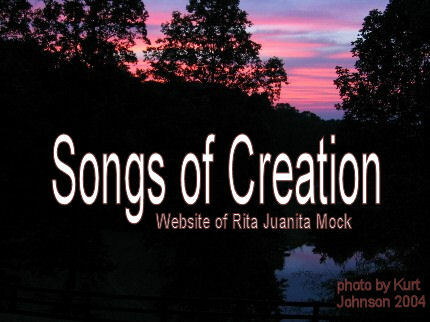 All written or photographic materials on this website are the copyrighted property of Rita Juanita Mock, unless otherwise noted.